The Younger Edda, also known as Snorre’s Edda, or the Prose Edda, is a collection of Old Norse poems preserved by Snorri Sturluson (1179–1241). The Prose Edda forms the basis of what the world knows as Norse mythology, and contains legends of the creation of the cosmos and the best-known stories of Odin, Thor, and the other gods. 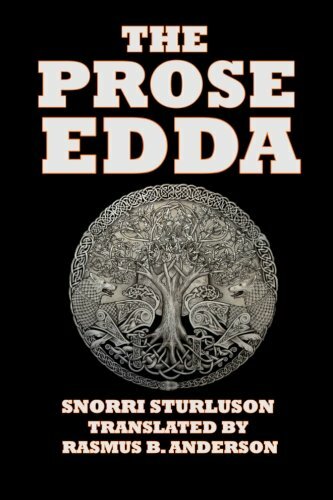 The Prose Edda was originally referred to as simply the Edda, but was later called the Prose Edda to distinguish it from the Poetic Edda, a collection of anonymous poetry from earlier traditional sources compiled around the same time. This version contains an English version of the Foreword; the Fooling of Gylfe, the Afterword; Brage’s talk, the Afterword to Brage’s Talk, and the Important Passages in the Poetical Diction (Skáldskaparmál). It also includes an introduction, a full set of explanatory notes, a vocabulary list, and an index. The Prologue is a euhemerized Christian account of the origins of Nordic mythology: the Nordic gods are described as human Trojan warriors who left Troy after the fall of that city and who settled in northern Europe, where they were accepted as divine kings because of their superior culture and technology. The Fooling of Gylfe tells of the creation and destruction of the Nordic gods’ world, and deals with many other aspects of Norse mythology. The Skáldskaparmál consists of a dialogue between Ægir, a god associated with the sea, and Bragi, a skaldic god, in which both Nordic mythology and discourse on the nature of poetry are intertwined.